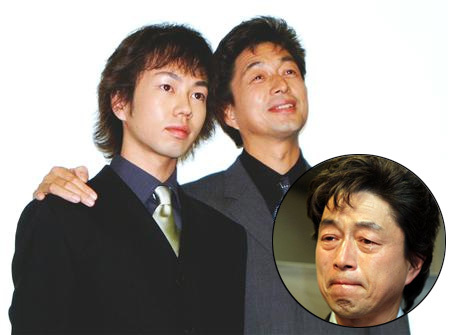 Veteran actor Nakamura Masatoshi (58) was in tears as he apologized to reporters yesterday for the arrest of his son. Actor Nakamura Shunta (31) was arrested by Tokyo Metropolitan Police on Saturday when he was found in possession of hash in the western Tokyo suburb of Suginami. He was sitting in his parked car at around 3am when police in a passing patrol car decided he looked suspicious. About 0.3g of hash were found in the car and he was arrested on the spot. His father said yesterday, “I sincerely apologize to the many people imposed upon. When I heard about it, I thought it couldn’t be true. I wanted it to be a lie, but it’s true.” Speaking not only as a father but as president of the agency that manages his son’s career, he said, “He will leave the agency, and he will not work as an actor again. It has to be done. It’s for his own good.” His wife, actress Igarashi Junko (56) also apologized to reporters gathered outside their Tokyo home over the weekend. The elder Nakamura regularly tops polls of people’s ideal father figure. He and Igarashi also have three daughters. 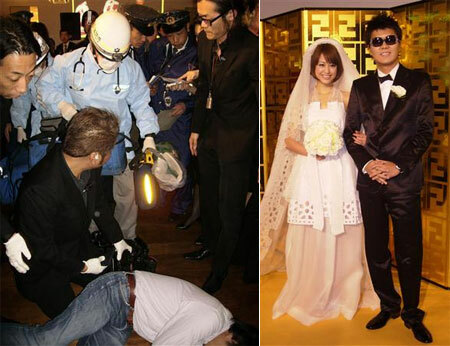 The husband of talento Uehara Sakura was arrested on Saturday night for assaulting a paparazzi. Endo Noriaki (37), founder and president of the Devilock street fashion brand, and his wife were attending the central Tokyo wedding reception of TV producer Ochi Masato (43) and his model/actress wife Chieko (22), who actually got married in July of last year. Endo was trying to take a photo of Uehara and the happy couple outside the Fendi store in Kita Aoyama when a photographer for a weekly gossip magazine tried to push him out of the way. Enraged, Endo’s floored the photographer with a single punch to the solar plexus. And when the man stayed down, police and an ambulance were called. Endo was arrested on the spot and the man taken to a nearby hospital, where he recovered consciousness. Endo and Uehara (32) married in 2003. She was pregnant at the time but later had a miscarriage. Endo has opened several Devilock stores overseas and toured as a DJ in the U.S. last year.